Hi there, hope you had a fabulous weekend. I have a friend of mine visiting for the week, so we are definitely having a great time, but I still wanted to pop in with a cute project which I created once again with the Floral Romance Suite as I used the stamps, the dies and even the paper and I also used a clear tiny treat box to make this project come alive. Check it out!!! Anyway, here is how I created this. 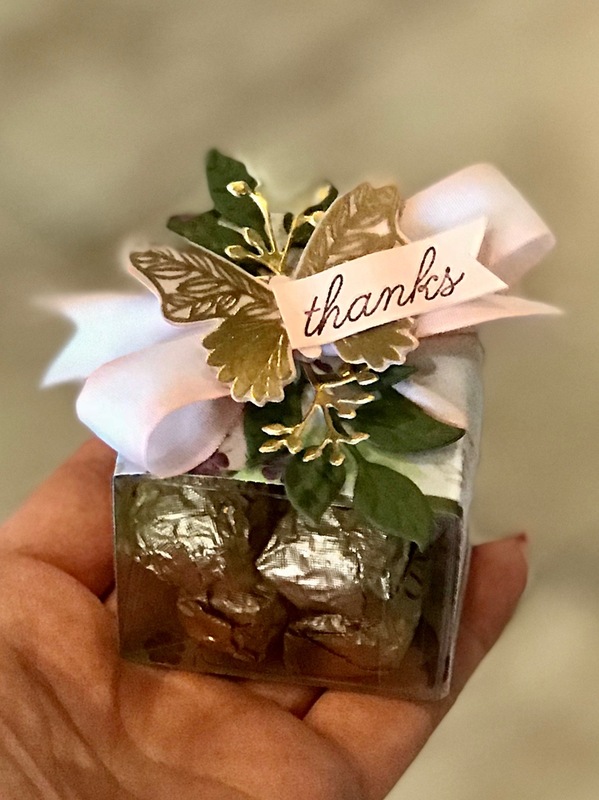 Build one of the cute clear tiny treat boxes and this would be a good time to put your treats inside, but not necessary as we will have a band that you can remove and fill the box later with the treats. Next cut a 2 x 9 strip using the printed vellum from the Floral Romance Specialty Designer Series Paper and shape it around the box and using liquid glue or Tear & Tape glue it together on the bottom. Cut off access paper. Cut a 12″ Petal Pink/Whisper White varigated ribbon and tie a bow around the band. 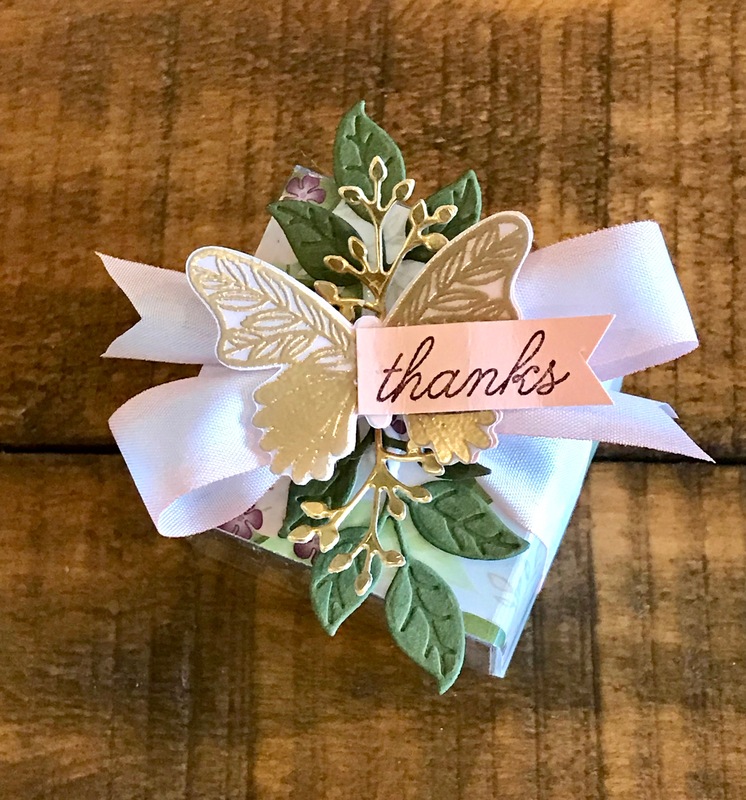 Next using Mossy Meadow card stock die cut two leaves from the Wonderful Floral Framelits Dies and using Gold Foil Sheet die cut two little leafy branches as well and tuck and glue them under the bow using liquid glue. Next, punch a Petal Pink card stock butterfly using the Butterfly Duet punch. Gold emboss one of the butterflies from the Butterfly Gala stamp set onto vellum and punch it using the Butterfly Duet Punch and glue it on top of the Petal Pink Butterfly and using liquid glue attach it on top of the bow. Finally cut a 1/2 x 1-1/2 Petal Pink card stock banner strip and stamp the sentiment on it using Fresh Fig ink. Sentiment is from the Beauty Abounds stamp set as it was just the right size. Here is a close up look of the treat box from the top so you can see all the pretty layers. So, what do you think? Are you ready to recreate this? I think anyone would love to receive a little treat box like this! Anyway, if you would like to recreate it, here is the link to download the tutorial. And here is the list of the items I used to create this little project. Thank you so much!!! And you are so welcome and hope you make it, too!